What’s the "Point" in Grading? Report cards went home today, and I couldn’t help but feel a slight bit of contentment for the whole process of grading when handing my students the 8.5″ by 5.5″ manilla envelopes. On that piece of paper that I sent home was a series of letters and numbers, which, in and of itself, provided some information, an overall proficiency as compared to grade level expectations in the selected outcomes for the trimester, but little descriptive information, as to provide the true feedback that students and parents need. Do I believe in assessing? Yes. Do I believe in providing feedback to parents and students? Of course, I do, for little learning occurs without timely and effective feedback. Do I, however, believe in labeling students with cumulative letters to provide that feedback and gauge proficiency? No, I certainly do not. Unfortunately, the current system in which I work requires me to do so, and I have been forced to align my grading practices to it. What are my philosophies on grading? As is the case with all other facets of curriculum, instruction, and assessment, I believe that all things should be grounded in an outcome. An outcome usually refers to a transferrable skill such as, “Students will be able to identify figurative language and explain the author’s use of it” or “Students will be able to determine the main idea and details in order to summarize an informational text.” Additionally, I believe (and with support from educational research, mind you) that these outcomes should be the foundation for our assessment, and likewise, the platform on which we “grade” our students at the end of a grading period. 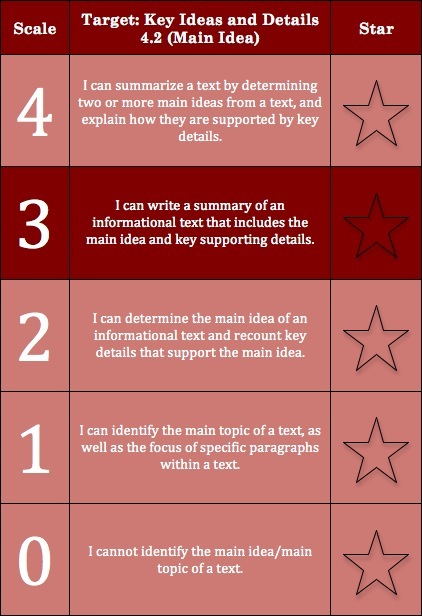 For instance, let’s examine the outcome on summarizing informational text. If one was to assess a student for the report card and provide a grade to that student, it would be necessary to deconstruct that outcome and create a proficiency scale on which the instructor could rate the student’s capabilities. To the left is an example of that scale. As you can see, students could lie at any place on this scale, and by providing students and parents a number aligned with a rating (after an assessment), I am able to provide information as to what students will be capable of doing, rather than the number of points they receive on a test. If Johnny is rated at a (2), it is very clearly stating that Johnny is able to identify the main idea and details of a text, but is not able to write a summary quite yet. Likewise, if Sarah is rated at a (1), it shows that she is able to identify the main topic of a text, but not quite able to identify the full main idea and details. By using this proficiency scale, not only am I able to provide feedback and a strong rationale for my student’s grade, but I am also able to clearly see where my student’s next step is in the learning progression. For instance, for Johnny, I would be working on transferring the main idea and details he recites into a cohesive and well-written summary. For Sarah, on the other hand, it will be more important to work with her on identifying a full main idea and the details that support it, rather than jumping to a full summary. I grew up in the generation that valued points and percentages, as many of us did, but really, what did these numbers tell us? I remember slyly planning out, prior to my final, the minimum number of points I would need in order to maintain my grade in the class, so that I could then determine how much I would need to study for the final. What a terrible attitude! Instead of studying for some of those finals, to be sure I would be scoring well, I decided to blow those off, for some of those finals, I could have passed half the test and still managed to maintain a B grade. Now, does that show proficiency? Hardly. Instead, it simply shows the inadequacy of this antiquated grading practice and the little feedback it truly provides students and parents, alike. So what comes first, the chicken or the egg? Do poor grading practices come first, or do poor test creation and administration skills come first? In my opinion, there is no answer, and it seems to be a combination of both. In essence, we teach the way we were taught, for the most part, without putting much thought into why we are doing the things we are. Many of us learned through tallied up tests, with a point total and a percentage at the top of the paper. However, if we begin to change the way we view grades, we will change the way we write tests, and in effect, we will change the way we are grading tests and providing feedback to students. Instead of grounding tests in points, grounding a test in the proficiency scale makes it, actually, much easier to write. Instead of providing 20 test items to give you a nice round number to which you can calculate the percentage, try providing 18 test items, with 6 at each proficiency 2, 3, and 4 of your scale, so that you can accurately assess a student’s ability to perform the outcome, as well the the target that shows the preceding and enriched expectations. In some cases, however, you may not even need to provide 18 test items. For instance, when writing a summary, as mentioned before, the quality of the response can merely serve as the evidence for the proficiency. If they provided a main idea, but no really “summary” of the story, then they have shown they are capable of (2) behavior. However, if they’ve shown they are able to argue multiple main ideas within a selection, based on their summary, then they will earn a 4. In essence, this becomes a clear and descriptive measure of what a child can do, by correlating a number with a target deconstructed from a broader outcome. What are grades really for? What’s the point? Overall, grades should be for providing feedback. They should not be for punishment, they should not be to discuss effort or creativity, and they most definitely should not be a means through which you tally up homework completion. Rather, grades should show proficiency in the grade-level targets, in order to paint a picture of success or lack thereof in those targets. More importantly, they should be for providing feedback with which parents and students can actually do something. Receiving an “A” on a report card tells students very little: It does not tell them what they need to continue doing, and it does not tell them in which areas they exceeded the expectations. Likewise, “C” only promotes a negative attitude towards school and little to no feedback on what needs to improve. By changing your outlook on grading, you can change your use of assessment in the classroom. Instead of simply using it for the report card grade, it can suddenly be used to drive your instruction and promote more self-directed and informed learning in your classroom, which truly, is what most teachers hope for their kids.